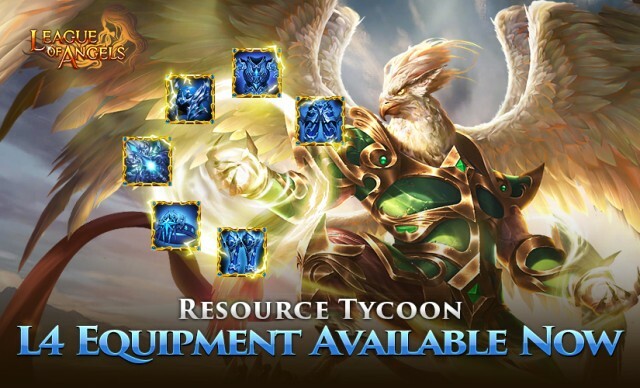 Cross-server Resource Tycoon: L4 Equipment Available Now! The much-anticipated L4 Equipment is finally available! With an extra skill than the previous L3 Equipment and much more stats added, the L4 Equipment has caught players' eyes since it was introduced in game. Plus, Lord Skyscream will make his second appearance in CS Resource Tycoon from May 22 to May 27. Great news is that, the TOP SIX winners in the overall ranking will have the honor to win both Lord Skyscream Crest and the L4 Equipment! In addition, ranking 1ST will be able to take powerful mount, Ancient Gogadon, to the squad! From May 22nd to May 27th (server time), you can gain points by collecting required resources during the event, i.e. Spring of Glass, Flaring Heart, Beast Crystal, Magic Mount Soul, Purgatory Soul, Ascension Stone, Element Scroll, Seraph's Stone, Refine Ore, Khaos Core, Blessed Stone, Soulstone, Grotto Heart and Diamond. Note: Gain Spring of Glass, Purgatory Soul and Element Scroll for 2X points! Tycoon Mystic Deal has all the hot heroes and weapons covered. Crooked Claw, Skeleton Devotee(and his exclusive amulet), Styx Lord, Golden Disciple, Carnage Queen, Genesis, Celestial Blade, Hecate, Styx Guardian, Ghost Dancer and many more are available here. Check the Tycoon Mystic Deal in Hot Events from May 22nd to May 29th (server time)! Various resources, gem chests, angel essence chests, and even powerful mounts can be gained by accumulating points and reaching certain Recharge amount in Lucky Points. Take Taotie, Shimmer Taotie and Primeval Fiend if you've met the requirements. Change Ancient Gogadon to Hellfire Dragon freely if you don't like the former. In addition, Lvl. 9 Angel Essence Chests are newly added. Seize the chance to make them yours from May 22nd to May 29th! Please note that the above content might be adjusted due to changes of the development plan. Final updates will be determined in game. More exciting events are coming up through May 22nd to May 27th (server time), check them out in the in-game Hot Events menu now! Last edited by Sidhe; 05-22-2018, 05:06 AM. This was an epic fail. You have a whole server who has not recieved points for half of the event. Devs need to respond!!!!!! Please open a thread in the corresponding section of the forum and post there the issue/s you are facing, this is an official announcement thread. Be more specific about what "epic fail" you're referring to, give your data and add pics/screenshots, as well. Those are needed elements for a proper report and will allow us to help you with your problem. Thank you.